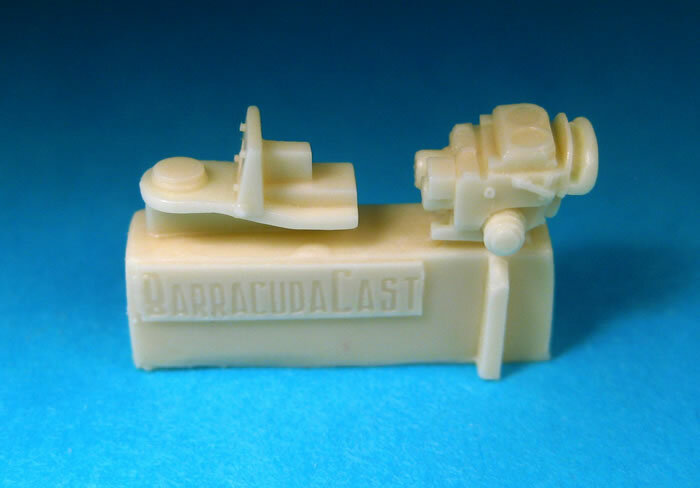 Barracuda Studios is proud to announce the release of 4 new 1/32nd scale products in the BarracudaCast resin detail set line. These sets are now up on the website and available for order. The first three sets are designed to super detail the large and highly visible cockpit for the superb new Tamiya P-51D Mustang in 1/32nd scale. 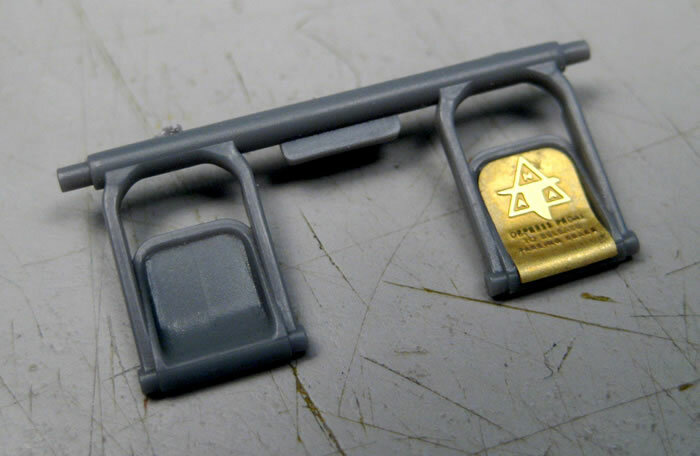 These sets provide an extra level of superdetail not possible in even the best injection molded kits, and the Tamiya Mustang certainly meets that criteria. 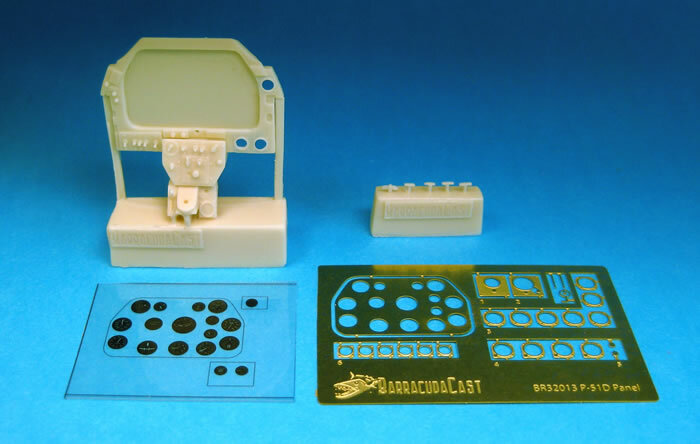 For modelers who want to take their P-51D Mustang's "to eleven", BarracudaCast has the parts you are looking for! The final new set is also for the new Mustang, but addresses the paper-mache drop tanks often carried into combat. BR32012 P-51D Mustang Cockpit Sidewalls NEW! This set consists of new super detailed, accurate resin sidewalls, which replace the Tamiya kit parts. Many handles and levers have been molded separately to ease painting and improve accuracy. Trim wheels have finger grips, the canvas bag for the flare pistol features zipper detail, switches are realistically represented are there also. A fret of photoetched parts rounds out this set, and it includes a number of cockpit details such as the perforated canopy rails so visible on the real aircraft, rudder pedal inserts with NAA logo, bomb salvo levers and new breather plates. 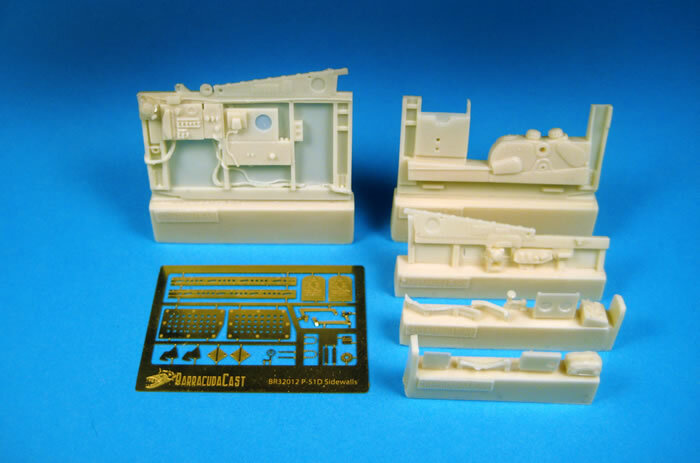 This set may be adapted to fit other 1/32 Mustang kits such as the old Hasegawa kit and the newer Dragon kits, and will be a noticeable improvement over the kit parts. Also see image at the top of the page. BR32013 P-51D Mustang Instrument Panel NEW! The Tamiya kit instrument panel is replaced with a mixed media parts featuring a resin main panel with improved knobs and switches. The main instrument panel has been replaced with a multi-part photoetched assembly with readable and authentic film dials. 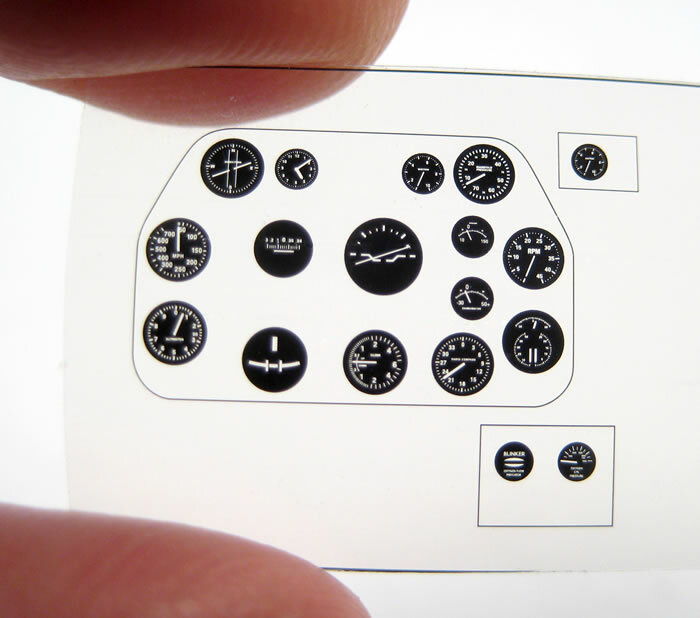 The instrument bezels have been etched separately in order to get the full relief not possible in single part panels. This is a little extra work, but the results will be worth it! Photoetched ring and bead site parts are included. Designed for the Tamiya kit, but can be modified to fit other Mustang kits. BR32014 P-51D Mustang Cockpit Upgrade NEW! 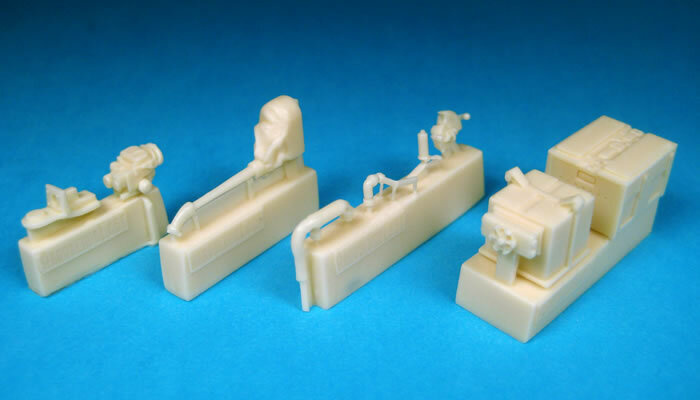 This upgrade set contains a number of cockpit components that benefit from being produced in resin, allowing more accurate and detailed parts for your P-51 Mustang's cockpit. Fully detailed radio and batteries come complete with a battery wiring diagram. The radio includes resin wiring harness parts. The throttle quadrant is new, and comes complete with two throttle levers, the early and late style with Belden cable mounting. Our stick has much new detail on it, and the set is rounded out by a much more detailed and accurate K-14 Gunsight with its special mounting bracket. BR32016 P-51D Mustang Paper Droptanks NEW! Super-detailed, seamless nose and tailcones for Tamiya’s 108 gallon drop tanks capture the rough, scalloped look of the paper mache. 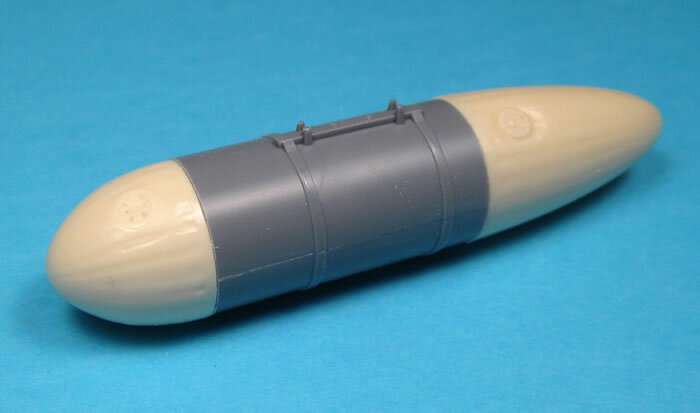 The paper drop tanks in the Tamiya Mustang kit are accurate in shape and size, but they do not capture the "look" of the end caps on the real tanks. The real tanks are made of compressed, impregnated paper. The nose and tail caps were laid up with paper mache style strips and have a slight ribbed effect with a rough surface texture. Tamiya's kit parts are smooth with even spaced radial lines scribed around them. 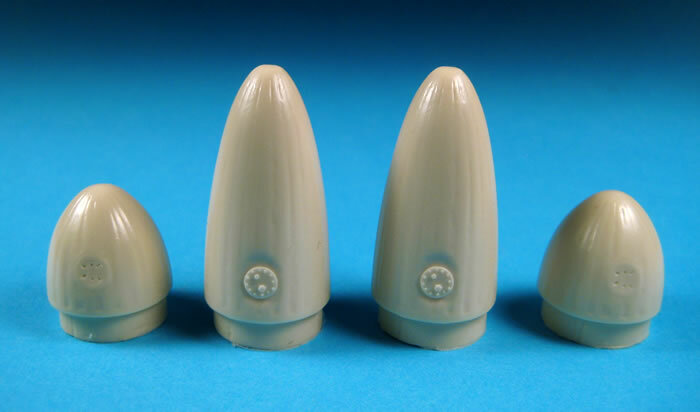 While designed specifically for the Tamiya kit, the Barracuda Studios parts can be used with the Dragon 1/32 P-51D. All sets are straightforward installations, and all parts have been test fitted in pre-production, so there are no nasty surprises when it comes time to install them. Most of the cockpit parts directly replace the kit parts, and no thinning and scraping of the sidewalls is necessary. All sets come with detailed, clearly written and illustrated full color instructions. Don't forget that we also have a very cool set of decal cockpit stencils and placards that will really add life to your new cockpit. BC32010. See website for more information. Hope you enjoy these new sets, and we are working hard to bring you more new stuff shortly.